Do We Believe God Loves Both the Bully and the Victim? Recently as I was checking online for the scores of my college team, I heard crying come from the other room. My wife was using this “play by yourself” time to catch up on some needed work. I was first to respond to the scene. Our youngest was under the covers of our bed crying with our oldest sitting over her saying she was sorry. Time to open the investigation. It turned out that the oldest wanted the youngest to do something. When she couldn’t do it, the oldest bit her twice. Naturally concern and attention went to the youngest. Hold her. Comfort her. Make her feel safe. Can You Love the One Without Hating the Other? Once she settled down, I dropped her off with mom for some extra attention and turned my attention toward the oldest. What am I to do? They are sisters. I can’t permanently remove them from each other. I love them both. Sure I will discipline the oldest, but I also don’t want to crush her spirit. How Would God Handle It? Can you imagine this is what God does day in and day out. He has a huge heart of love for each person—those that are mean and do evil things and those that have evil things done to them. He is able to go to the child who has been molested to give comfort healing and peace. He is also just as able to go to the child molester and calmed their storm and give forgiveness. Somehow while maintaining justice, God can love the one without hating the other. Corrie ten Boom was a victim of the evil concentration camps in Nazi Germany. After the war, she was in a church in Munich telling the story of the forgiving God. At the end of her sermon, a guard from her concentration camp came forward. Recognizing him, fear and pain once again gripped her heart. He introduced himself and asked to hear her say she forgave him. 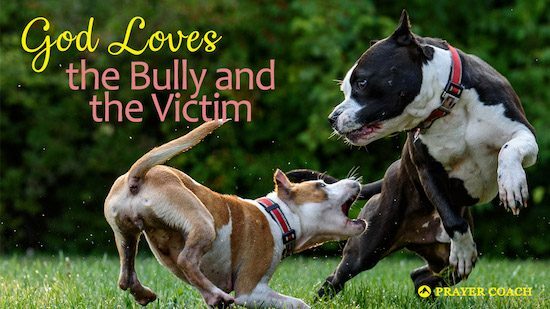 Do We Believe God’s Love is For Both the Bully and the Victim? Can He love one without hating the other? If we dare to believe that He can and He does, then we can follow Corrie’s example as she extended her hand to forgive. Even as she did so out of complete wooded faith, God showed up and send a current of His healing down to both her and this guard. Love had been release and received. We need to embrace a God who can love the bully and the victim because we have been both ourselves. We need to embrace this truth to fully hold to the truth of our forgiveness. And, as we release forgiveness on others, we open ourselves up to more of the love of God. I am forgiven and protected by God. I choose to release all those that have hurt me and bless them that I may pursue life. ← Is This How You View Prayer? I read your reference to Corrie Ten Boom’s experience after the war, and it struck me as being wrong, so I reread the passage in “The Hiding Place.” It was wrong. It was not “fear and pain” she felt , but anger. If it was just error, there is no problem. However, if it was an intentional decision to not mention that a hero was angry, then that is political correctness , and political correctness is lying. There is nothing wrong with a hero being angry, and remolding Miss Ten Boom to fit some politically correct standard is essentially an attack on her character. All of that being said, I applaud you for encouraging others to pray. You use way to many words, however. Half as many, carefully selected, would be much more effective. Dear Jeff, Thank you for you comment. I was not deliberately hiding I saint having anger. I took my notes about this conversation from the link I included in my post. It was an excerpt from Guidepost article, which I think was an edited version of the Hiding Place. My words of fear and pain were the feelings I saw in the article. Anger is a natural expression of these two emotions. With you comment regarding the use of words, I will admit I am not a writer by trade. I will gladly link to some of your writings if you have examples of better usage. We cannot have too many encouraging words or articles to pray. Thanks again.